After signing into law the landmark Civil Rights Act of 1964, President Lyndon B. Johnson famously told an aide, “we just delivered the South to the Republican Party for a long time to come.” Indeed, the Johnson-Goldwater contest was notable in two important respects related to race: it featured the first appearance in almost a century of racial animus as a central dimension of partisan conflict in a presidential election, and it was the last time a Democrat received a majority of the white vote. Many commentators have argued that with these ads, Romney and the Republicans are “playing on the racial resentments of the white working class the same way Reagan did,” as John Judis recently put it. More generally, Peter Beinart and others have argued that Romney may be pursuing a “bubba strategy” aimed at courting working-class whites — or more specifically, non-college-educated whites — through their cultural conservatism. It is not news that whites without college educations have become a notably Republican constituency in recent years. Data collected in April by the Pew Research Center bears this out. White voters with college degrees split relatively evenly in their partisanship, but those without college degrees clearly lean Republican, with 54 percent identifying as Republicans and only 37 percent identifying as Democrats. Eight years ago, the gap was smaller, and educated and uneducated whites alike identified more with the Republicans than the Democrats by about nine percentage points. The growing Republican tilt of this group has drawn the attention of political analysts to how central the white working class is to the party’s strategy and advertising. The assumption here is that less educated whites are especially likely to be motivated by appeals that touch on matters of racial or cultural conflict, as in the race-coded ads about welfare and health care. While this assumption may accord with popular stereotypes about non-college-educated whites (recall Obama’s comment at a 2008 fund-raiser in San Francisco about small town people clinging to “guns and religion” and anti-immigrant sentiment), it overlooks recent research by political scientists that suggests that racial and cultural anxieties actually have their greatest political influence on better-educated whites. To begin with, the political preferences of college-educated whites are often more racialized than those of whites who did not go to college. According to research we have done using surveys of thousands of American adults, this is the case for attitudes toward the issue at the heart of the Romney campaign’s recent ad blitz, welfare. Although it is true that whites without college degrees are more likely to view African Americans as “lazy” or to express racial resentment, analyses of data from nationally-representative surveys indicate that whites who hold negative racial beliefs are twice as likely to oppose welfare if they have college degrees than if they do not. Put another way, given two white people, one who went to college and one who didn’t, the former is more likely to express his racial hostility politically in the form of greater opposition to welfare. Research on opinions about other policy issues corroborates this finding. Health care — an issue that is increasingly linked to racial attitudes due to its association with President Obama — provides an example. 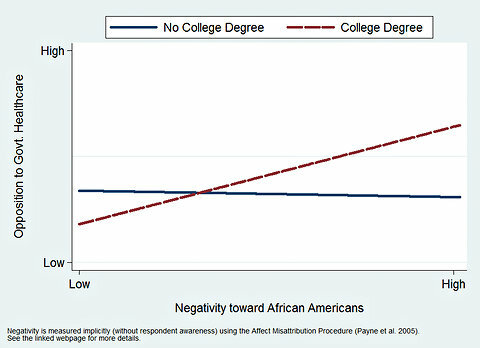 Analyzing data from the 2008 American National Election Study, we found no relationship between negative feelings toward African-Americans and opposition to government-provided health care among whites without college degrees. For college-educated whites, however, negative racial feelings were strongly associated with increased opposition to such reform. As the graph below shows, for whites without college degrees, feelings toward African-Americans are unrelated to whether respondents support or oppose government-provided health care. For college-educated whites, however, increases in negative feelings are associated with large increases in opposition to government-provided health care. But what about the supposed influence of a broader cultural conservatism — as opposed to one specifically focused on race —among non-college-educated whites? Here, research also confounds the presumption that less-educated, working-class whites are disproportionately driven to support the Republican Party because they hold conservative views on social issues like abortion, gay marriage and gun control. For example, an analysis of data from 20 years of national surveys (from 1984 to 2004) by the political scientist Larry Bartels reveals that whites with conservative attitudes toward social issues like abortion are actually more likely to support Republican presidential candidates if they have college degrees than if they do not. So why is racial animus more politicized among well-educated whites? The simple answer is that education imparts social and political knowledge that prepares people to better read the signals provided by political leaders and the mass media. In recent decades, these signals have subtly linked welfare and other government social programs with stereotypes of African-Americans. In some cases, these signals have come in the form of “coded” political rhetoric, like President Reagan’s famous story of the Cadillac-driving Chicago welfare queen. In other cases, they come from media coverage that over-represents the percentage of the poor who are African-American. Given that educated whites are more likely to pay attention to social and political affairs, it is not surprising that they pick up these signals and build them into their beliefs more thoroughly than non-college-educated whites do. What’s more, this effect is not merely due to the fact that educated whites are wealthier and thus more afraid of losing what they have to those they consider the “undeserving” in the form of higher taxes. The effect of education holds up even after statistical techniques are used to account for the fact that college-educated whites also have higher incomes. In sum, the racially tinged ads now running in Ohio, Colorado and other battleground states may succeed in influencing racially resentful white voters, but if so, the people they influence are more likely to be educated than not. Consequently, this is less likely to translate into more Republican votes, for two reasons. First, on average, educated whites are more racially tolerant than non-college-educated whites. Since racial tolerance diminishessupport for candidates who appear to make racial appeals, politicizing the racial attitudes of these voters is unlikely to be an effective strategy. Second, educated voters hold stronger partisan attachments than less educated voters. By the time they see campaign advertisements, they are more likely to have made up their minds about which candidate to support, and they will not be easily budged. None of our comments are intended to dismiss the political importance of issues like welfare; nor do they imply that all concerns about the scope of the welfare state are a subterfuge for racism. Indeed, difficult questions about the role the government should play in redistributing wealth and protecting the poor have historically been the main focus of ideological conflict between the political parties. However, as political scientists Michael Tesler and David Sears have argued in their book “Obama’s Race,” basic questions about the size and scope of government have inevitably been tainted by white Americans’ feelings and beliefs about African-Americans. We can only hope that important philosophical and practical concerns about the benefits and costs of government intervention — rather than racial stereotypes — will determine whether voters opt for more or less spending on welfare, health care and other safety-net programs.